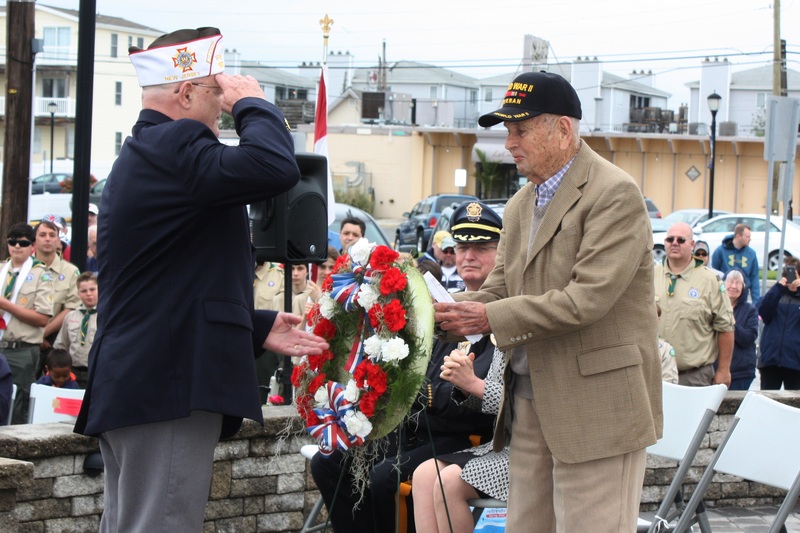 Sea Isle City’s annual Memorial Day Ceremony will take place at 10 a.m. on Monday, May 28, at Veterans Park, JFK Boulevard and Landis Avenue. The annual tribute to our nation’s fallen military heroes will be led by Mayor Leonard Desiderio, who will be joined at the podium by local veterans, religious leaders, officials from Cape May County and other members of the community. U.S. senatorial candidate Bob Hugin will also be on the dais. During the Memorial Day Ceremony, wreaths will be placed at the base of Veterans Park’s Memorial Fountain, VFW Post 1963 Commander Charles Haines will lead a Roll Call of Sea Isle’s Honored Dead, patriotic hymns will be sung, and Taps will be played. Immediately after the ceremony, Boy Scout Troop 76 will lead a procession to the JFK Boulevard Beach, where members of the Sea Isle City Beach Patrol will row a lifeguard boat beyond the breakers and set flowers adrift in honor of America’s Deceased Naval Heroes. For more information about Sea Isle City’s 2018 Memorial Day Ceremony, phone 609-263-4461, ext. 1245 or go to www.VisitSICNJ.com.